OK, I think I can hold off long enough to type for a few minutes. In the midst of all of Sony’s craziness, plus that whole Bin Laden thing, you might have missed out on some Diablo III news this past weekend. And of course, who could blame you? And what’s the news, you ask? Well, Blizzard gave a bit of a hands-on preview of Diablo 3 to the New York Times last week. While the article has some nice tidbits about the game that we mostly knew, and a few we didn’t know (such as a much simpler trading availability), the big shocker comes near the end of the article. Jay Wilson, Diablo III’s director, had this to say about the game’s development. 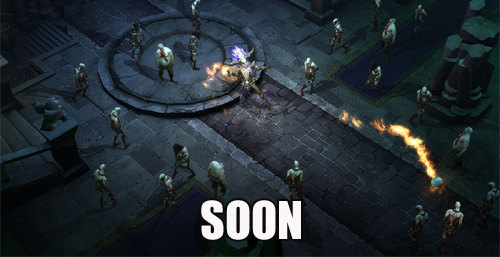 Now, maybe I’m just reaching here, but does this mean we could possibly see a Diablo III release in 2011? Blizzard as of yet has been noncommittal about when the game is going to come out, and have seemingly gone back and forth on it a few times. What do you guys think? Am I being too optimistic here? Place your bets on 2011 or 2012. Go! 2012, but maybe early to mid 2012. I hope to give this a go sometime as I hear nothing but universal praise for the series. 100% of gamers can’t be wrong, right? Hasn’t Blizzard always been untrustworthy when it comes to actual releases of their games ? Everything else about them is mostly perfect. I think Blizzard will be too preoccupied with Cataclysm to really worry about Diablo for the remainder of the year. Hopefully, I can look forward to a nice, stable 2012 midrelease. As per my last comment, I gave the wrong percent. Replace 23 with 83. Heh. Sorry ’bout that.